Things are so hectic at the moment and I apologise because I owe you a couple of post. I really need to find a few days that no one else knows about before Christmas, otherwise I am not going to get it all done in time. I did manage to get a few decorations up yesterday, with the help of my husband, and Saturday I got about 50 my cards in the post, along with a couple of parcels containing presents. But there is still so much more that needs doing, including around two dozen cards which I hand deliver. These three silly billies are from a House-Mouse project CD, I have them all and I cannot remember which one they came from, sorry. The matching backing paper came from the same CD. 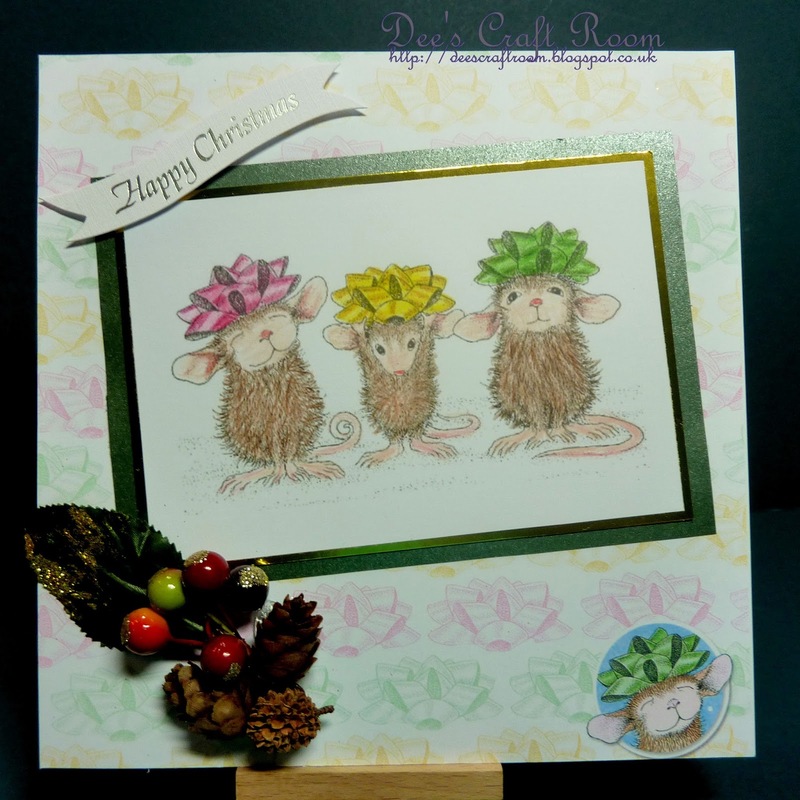 I coloured the image with my F&C polychromos pencils and then mounted it on gold mirri and pearlised green cards. I picked up the berries and leaf at my local garden centre and the mini cones are real, I got them from ebay along with the sentiment. We have three fabulous Guest Designers this week Lisa, Cecilia and Marina. They have made some amazing projects, please pop over to Crafty Boots and take a look. OMG, I am so in love with those little mice!! I want to adopt them and give them hugs and kisses! I love the way you coloured them and the bows are so festive and fun!! Oh, I cannot wait to see the photos, have a great time out there. I know, Christmas is getting really close now and I really need those secret days so I can catch-up. I really need to make a couple of cards to post and now my sister tells me there is a postal strike threated, eek. Oh, I meant to say that I did not colour the little guy in the bottom corner, he came printed on the backing paper - I really like this paper and the disc had loads of other papers, it was well worth the money. Oh my goodness such an adorable image! I like that little sign on the top with the gold shimmer. This is a great card! 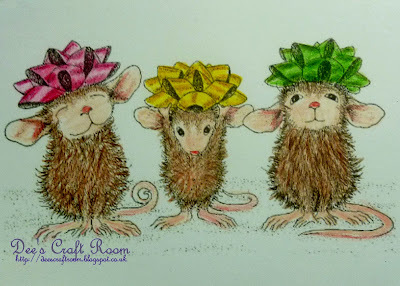 THank you so much, I think the House-Mouse bunch are so adorable but perhaps not the easiest things to colour. I do love House Mouse but I do not like their rubber stamps, so I was thrilled when they published the CDs with digi stamps as well as coloured toppers and there as so many pretty backing papers as well. I was impressed with how well they coloured with the pencils. If I could find a couple more weeks before the C day I would colour up a few more and perhaps get a head start on next year.